The Detroit Tigers figure to have an interesting position battle in center field this spring after trading Cameron Maybin to the Angels earlier this winter. There appear to be five candidates fighting for playing time in center field, and now a familiar face is joining the competition, veteran infielder Omar Infante. The 35-year old Infante is hoping to continue his big league career, and oddly enough, being part of the solution in center field may be his best chance. 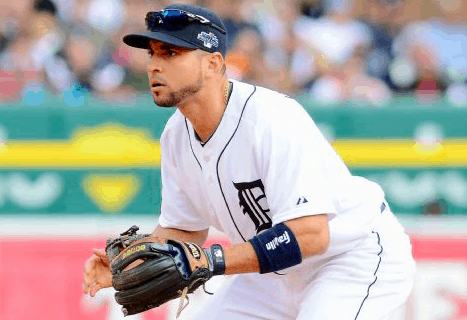 Infante first broke into the big leagues with the Tigers in 2002 and remained in Detroit through the 2007 season, so he is quite familiar with the organization. He was then traded back to the Tigers in 2012 and remained with the team in 2013 before signing with the Kansas City Royals. However, the Royals let him go last June. Infante signed a minor league deal with the Braves but was released by Atlanta in August. He signed a minor league deal with the Tigers in December in what could be his last chance to hang on in the majors. The Tigers signed Infante thinking he could perhaps win a job as a backup infielder, as he brings plenty of defensive versatility to the table. However, Infante sees the opening in center field and has his sites set on competing for the job. Infante has just 21 career starts in center field, the last coming in 2009 when he was with the Braves. He hasn’t played the outfield at all since 2010. The Tigers can’t exactly feel optimistic about the aging Infante handling center field, especially considering the size of the outfield at Comerica Park. Nevertheless, Infante wants to give it a shot and has confidence in himself. Early in the spring, a platoon between Mikie Mahtook and Tyler Collins appears to be the most likely scenario for the Tigers in center field. Of course, neither is an established big league regular despite showing glimpses of potential at times over the past few seasons. If nothing else, the duo of Mahtook and Collins should be able to provide solid defensive play in center field, which could be enough to fend off the other candidates. Prospect JaCoby Jones is also an interesting candidate for the center field job. Jones has limited experience in the outfield and has just 28 big league at bats to his name. However, he’s an exceptional athlete and could become a legitimate threat to win the job if he has a strong spring. The Tigers may also consider Anthony Gose and Alex Presley, who like Infante are in camp on minor league contracts.